Work on Victoria’s Johnson Street Bridge began early Sunday morning following a 24 hour delay. The new bridge deck span was supposed to be lifted into place on Saturday but was called off due to high winds. 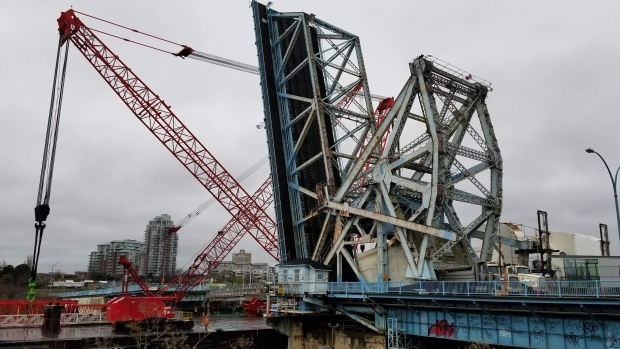 “One of the parts of this project is we have this big piece of steel hanging on cables up in the air while we pull a barge through and we simply can’t so that with winds that are gusting up to 40 and 50 km/hr, it’s dangerous,” said Project Director Jonathan Huggett. The Johnson Street Bridge will be closed to all traffic, including pedestrians and cyclists, until 5 p.m. Monday. Commuters are being advised to use the Bay Street Bridge during the closure.